It was my 21-year-old daughter who got me to explore red light therapy. She has some significant chronic health issues, and is an amateur biohacker and a diligent and thoughtful researcher. She was excited about the potential of red light therapy and sent me a bunch of studies. I had heard of red light therapy, but had never thought to take a serious look at it. There are so many health modalities out there, and it’s impossible to research all of them. Some are grounded in solid science, while many others have anecdotal evidence behind them, but lack scientific data. I assumed that red light therapy was in the latter category. After all, it’s just light. How wrong I was! What is red light therapy? First of all, let’s take a look at the light spectrum. 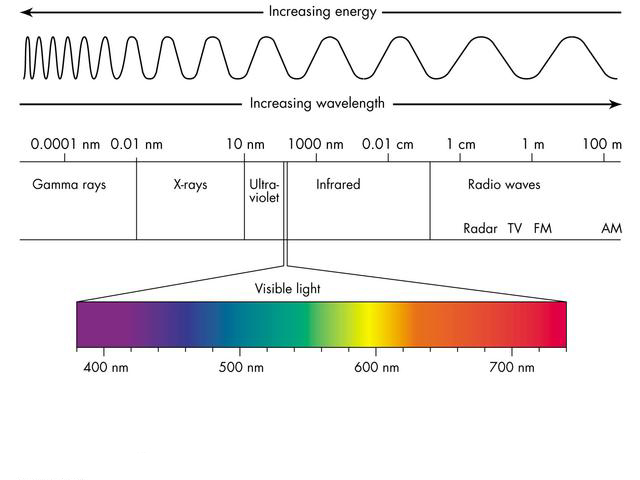 Visible light is only a tiny portion of the electromagnetic spectrum, which ranges from the short-wavelength (0.0001 nanometer) gamma rays on one extreme to the long-wavelength (100 meter) radio waves on the other. Humans can see only a small part of the spectrum, from about 390 to 700 nm. Below 390 is ultraviolet light; above 700 is near-infrared (NIR) light. I’ve previously written about blue light and how it can be detrimental to our sleep when we are exposed to it too close to bedtime. In addition to affecting our circadian rhythms, light can have an enormous impact on health in many other ways. Red and near-infrared light in particular has been shown to be therapeutic for a wide range of conditions. The list goes on and on and on! I’m particularly interested in the positive effects on joint and muscle pain, since this seems to be my Achilles heel (ha!) - I have had tendonitis in my knee, shoulder, and both wrists, and I frequently have lower back or neck pain. How can simply shining light on the body result in such dramatic and diverse health effects? Every cell in our bodies, with the exception of red blood cells, contain mitochondria, commonly referred to as the energy powerhouses of the cell. Mitochondria keep very busy manufacturing adenosine triphosphate (ATP), the energy currency of the body. All activity within the cell is fueled by ATP; without it, the cell would quickly die. Mitochondria contain tiny light-sensitive receptors called chromophores. Red and near-infrared (NIR) light can penetrate deep into the body, when it is absorbed by chromophores within all kinds of tissues: muscle, bone, skin, and organs. 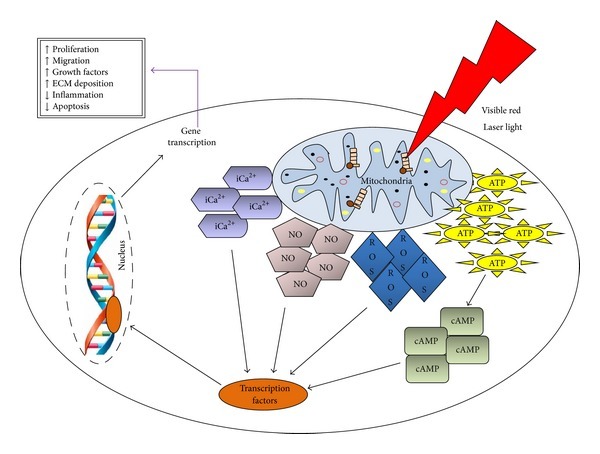 When red light and NIR light reach the mitochondria, the photons are absorbed by a light receptor enzyme called cytochrome-c oxidase, which stimulates the production of ATP in the cell. The take-away: red and near-infrared light act to increase production of ATP, which increases the energy with which the body performs all its essential functions! Most of the early work in this field was carried out with various kinds of lasers, and it was thought that laser light had some special characteristics not possessed by light from other light sources such as sunlight, fluorescent or incandescent lamps and now LEDs. However all the studies that have been done comparing lasers to equivalent light sources with similar wavelength and power density of their emission, have found essentially no difference between them. Wavelengths of red light (600-700 nm) and near-infrared light (NIR, 770-1200 nm) have shown positive results in hundreds of studies. There are many companies making products for red light therapy, but two in particular are making a big splash in the ancestral health community: Joovv and SaunaSpace. Both make highly-regarded light therapy devices for use in the home, with one big difference: Joovv uses LED lights, while SaunaSpace uses incandescent heat lamps. The Joovv consists of one or more panels with many LED lights. It emits red light at 660 nm and near infrared light at 850 nm; all the energy output is concentrated at these therapeutic wavelengths. Incandescent bulbs put out a lot of heat, and SaunaSpace, as you might have guessed from the name, doubles as a sauna. 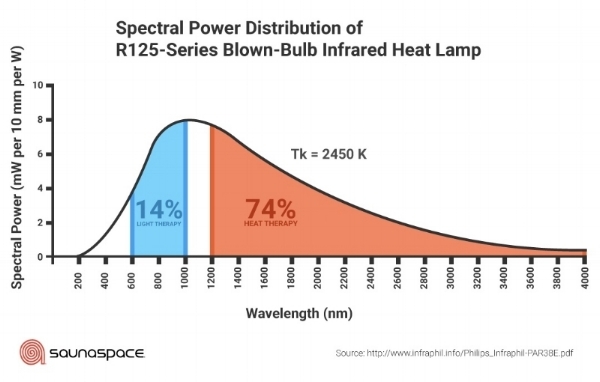 The bulbs emit full-spectrum light, with the majority of the light in the 600-1400 nm range. As illustrated in the image below, 14% of the power is in the therapeutic range, with a much larger part producing heat. Joovv and SaunaSpace both make compelling arguments asserting theirs is the superior product. Users seem to love both products. Both are highly recommended by experts I trust; Chris Kresser and Terry Wahls use the SaunaSpace, while Robb Wolf and Sarah Ballantyne use the Joovv. After doing her research, my daughter decided she wanted to give the Joovv a try. She has used it for three weeks now, and remains cautiously optimistic. It hasn’t been the life-changing device she was hoping for, but she can feel a difference, especially immediately after using it. Joovv states that it could take 8-12 weeks of consistent use to see significant results, so the jury is still out. The SaunaSpace and the incandescent heat lamps appealed to me over the Joovv for a couple of reasons. I really dislike LED lights; I’m very light-sensitive, and bright lights, especially LEDs, can be a migraine trigger for me. The full-spectrum, “natural” light of the incandescent bulb appeals to my hippie instincts. Plus, with the SaunaSpace, you get a two-fer: red/NIR light therapy, plus the heat of a sauna, which comes with a wide range of additional benefits. My daughter’s health is one thing; for myself, I was not willing to invest a lot of money on a light therapy device. Even the smallest and most basic versions of both the Joovv and the SaunaSpace cost hundreds of dollars (and go up to several thousand dollars for the bigger versions). However, the same exact bulb used in the SaunaSpace is available for less than ten bucks! That sounded like an investment I was willing to make.